When: June 8 – 10, 2019 (9-5 each day). Registration is available for either two or three days. Dr. Susan Friedman will be presenting a condensed version of her course Living and Learning With Animals over three days. This seminar focuses on the fundamental principles of learning and behaviour, the behaviour change technology known as applied behaviour analysis, and functional assessment and analysis. It is suitable for professionals of all levels working with all species, including humans. Non-professionals with a keen interest in behaviour science will find plenty to learn here as well! Further details on topics are available below. Dr. Friedman has worked extensively in the field of Applied Behaviour Analysis and is a professor emeritus at Utah State University. She presents internationally on behaviour and training and consults with zoos around the world on a variety of species. Please fully review the details in each tab below before registering. As a result of attending this seminar, participants will be better able to teach learners effectively and humanely. the purpose the behavior serves for the animal (i.e. the consequences the behavior produces). With this information, environmental changes can be made to make the problem behavior irrelevant, inefficient and ineffective. Without this information, the wrong behavior may inadvertently be reinforced. At the same time, acceptable alternative behaviors can be reinforced to meet the same, or different, functions for the animal. A framework for accomplishing a functional assessment, analysis, and systematic intervention planning is presented. Susan G. Friedman, Ph.D. is a professor emeritus in the Department of Psychology at Utah State University. She has helped pioneer the cross-species application of behavior analysis to animals, using the same humane philosophy and scientifically sound teaching technology that has been so effective with human learners. Susan has co-authored chapters on behavior change in four veterinary texts, and her popular articles have been translated into 14 languages. She gives seminars on animal learning at conferences, and consults with zoos around the world. Susan is a member of Karen Pryor’s Clicker Expo faculty, and teaches yearly hands-on animal training workshops with Steve Martin (Natural Encounters). Susan was appointed to the F&WS Condor Recovery Team from 2002 – 2010, after which time the team was retired due to the success of the birds in the wild. She is the Chairperson of the Scientific Advisory Committee of American Humane Association (AHA) Film and TV Unit, and a member in good standing of ABAI, AZA, ABMA, IAABC and IAATE. 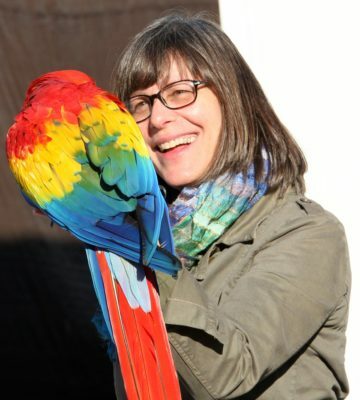 Last year she was included on the Vet Tech College’s list of “15 Animal Professors to Know.” Susan’s acclaimed on-line course, Living and Learning with Animals for Behavior Professionals, has provided even wider dissemination of effective, humane behavior change practices to students in over 35 countries (Behavior Works). Flexible automatic payment plans are available for all tickets. A fee will be charged for payment plans. Details on plans are available at registration. *Note that the payment plan will allow you to make payments until June 1st, although the registration deadline is April 30th. All ticket sales are final. Payment plans must be completed in full in order to attend. Tickets are transferrable (please contact). We recommend checking your email immediately after registration to ensure that emails from us are not being marked as spam. If they are, indicate to your email provider that they are not spam to ensure that you receive communications about this event from us. This seminar is for people only. Please leave your pets at home. If you would like CEUs for another organization, please contact us. Rest easy! Make your morning commute a little easier by staying on site at the Radisson Hotel & Convention Center. Preferred group rates are available. Each room in the group booking has two queen beds and includes a complimentary breakfast for two guests. These rooms are $124/night. You will need a credit card to make your reservation. If you want to find another attendee to share a room with, please make a post on the Facebook event page. Please note that this is entirely at your own risk, and you are fully responsible for all costs associated with your reservation. Ready to book your hotel room? Call 780-468-5400 to make your reservation (Block Name: Good Boy Dog Training). Fill in your arrival and departure dates on their website. Hit the search button and complete your booking. Please register using the links below. If you choose to pay in full at registration, you will be taken through our standard checkout process. This is an event for humans only, so please make up whatever dog information you like to complete the mandatory fields on the checkout form. *Note that while the registration deadline is April 30th, the payment plan option will allow you to schedule payments up to June 1st. Obedience and behaviour training you can trust in Edmonton, Alberta.